It was during my time as director of the Nickelodeon Theatre’s Helen Hill Media Education Center that I was introduced to its’ namesake. Helen, a Columbia native, was an extra-ordinary filmmaker and artist. I was unfamiliar with her work in 2013, but I was very familiar with her passion – filmmaking and education. I took the position as Director of the new center because of my own passion for film and education. After years of attending career fairs and hosting field trips during my tenure at Genesis Studios, I deeply felt a need to do more. At the center I had the opportunity to create programming, change curriculum, and give young kids tools that could potentially change the trajectory of their lives. Helen had this simple idea that I latched onto very early: “anyone can make a film, all you need is a good idea.” I fell in love with it. But I must admit, I always thought the second half of that phrase was missing something. I think what Helen was trying to say was all you need is a good idea AND the tools. 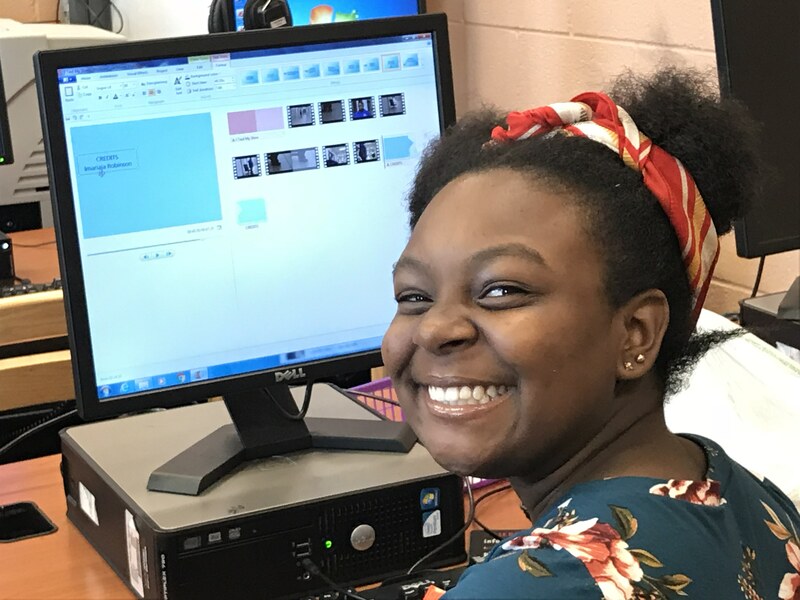 This past summer, for the second year in a row, I had the pleasure of hosting a three week Media Literacy Workshop for the Olympia Learning Center here in Columbia, SC. 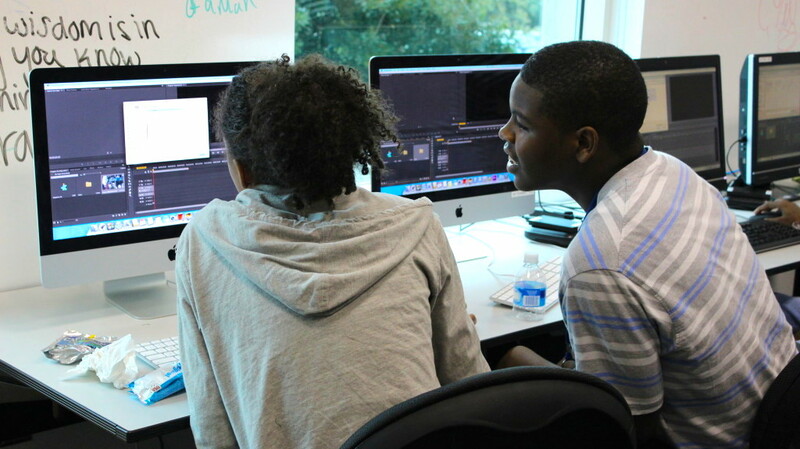 Students and teachers got a chance to learn the basics of moving image literacy. Basically, how to use the video camera to communicate a story, message or idea. I take great joy in teaching people the tools to change the way they think and teach them how to look at video in a totally different way. But the absolute ultimate joy I feel is when a person has that “eureka” moment. Watching a “eureka” moment happen in real time is like watching your favorite team win the game on a buzzer beater. It’s the same feeling of watching the joy on a child’s face after their first bike ride without training wheels. It is complete euphoria. This occurred several times throughout my workshop at Olympia – with teachers, students, and administrators. But there is one moment I will never forget. The first day Michael came to our session was at least a week into our workshop. I’ve seen kids like him hundreds of times. Baggy clothes, not speaking, clearly bored with the lameness of school as well as the students around him. He came in and slumped over in his desk to sleep. It didn’t take long for me to know he was a problem student. In fact, I later found out our session was the first time he has participated in any class that summer. Something remarkable happened only fifteen minutes after class began. Because Michael didn’t have a partner to film his first practice exercise, I decided to partner with him. At first, it was complete resistance. More than once he stepped away from the camera to mention how “this was lame” and that he didn’t know what to do because he had never done it before. That last statement was often followed by a snicker – a small punctuation to let me know how ridiculous he thought this class was. About halfway through the exercise Michael started giving me his own thoughts on direction. By the time we got to the last shot, Michael was fully directing. He quickly understood the concept of how a wide shot, medium shot, or close-up can be used to communicate a thought. I could see his mind visualizing how each shot would work together in the edit. His eyes would wander each time he looked in the air when directing me on that last shot. Several times he moved the camera, mumbling phrases to himself like “no, that doesn’t work” or “yeah, that looks good right there”. Little did Michael know, that when he walked out of the class to leave me there alone, my eyes welled up with water. Which I quickly wiped away in case he, or anyone returned. So many times students aren’t given access to the tools and resources that can literally change the way they learn. The same tools that could possibly change their lives. In many cases, those students are children of color. These students are often written off because of their behavior, demeanor, or because of their appearance. Too often instructors forget how valuable that learning tools are. Forget how valuable taking chances are. Forget how valuable these students are. Michael only came back twice after that day. Another student finished the edit on his film, but we made sure to put his name in the credits. Turns out Helen was right, anyone CAN make a film. All they need is a good idea…and the tools. And maybe a instructor that cares doesn’t hurt either. This Spring, I had the pleasure of filling some really big shoes. A colleague and one of the nicest people I know, Producer Betsy Newman, was stepping down from her teaching position at Columbia College – a historically liberal arts women’s college here in Columbia, SC. She was looking for someone with experience in teaching and producing film to takeover her film classes. I was immediately intrigued, because I grew up not too far from the school; a nappy headed kid from a tough neighborhood called Ridgewood. How cool would it be to not just advocate for my community, but to also contribute to one of it’s nearby institutions? But it wasn’t until I met Dr. Nancy Tuten, the chair of the Communication, Language and Literature department, that I accepted the position – and here is why. For close readers (pun-intended), you may have immediately noticed something a bit unusual: a film class in the communication, language and literature department? Usually on college campuses around the world, film and video classes are housed under either an Art or Media Art Department. Occasionally, one will find the film theory or film history classes tucked somewhere in an English or History Department. However, my years of working in moving image literacy has taught me what I now know to be true: the best way to teach film and video IS to teach it as a language FIRST. Let me elaborate. Film is, in itself, a form of communication. It is the very reason why it is taught as a part of Media Literacy Education. Because literacy is the ability to read and write, any organization that teaches film or video and doesn’t teach how to read and write with film, is failing its students. The ultimate goal when teaching, is to help students’ get to a point of understanding. Once they understand, they win – that is a victory. Teaching ‘use’ only is setting a student up to lose. It is the equivalent of teaching a student how to USE a hammer and nail, when they came to learn how to build a house. There is a giant leap between learning how to hang a picture and learning how to turn pieces of wood into a livable structure. Columbia College was interested in teaching their students how to communicate with video, FIRST. The class, WRIT 350: Introduction to Narrative with Digital Video, begins with learning the language of film. From the first day of class we ask questions such as: What are the 5 rules of Media Literacy? How do filmmakers use composition to communicate a message? What does that mean? How can that help me READ film? How can it help me WRITE my own messages? Of my small class of thirteen students, only two of them had prior video experience – and that was in high school. 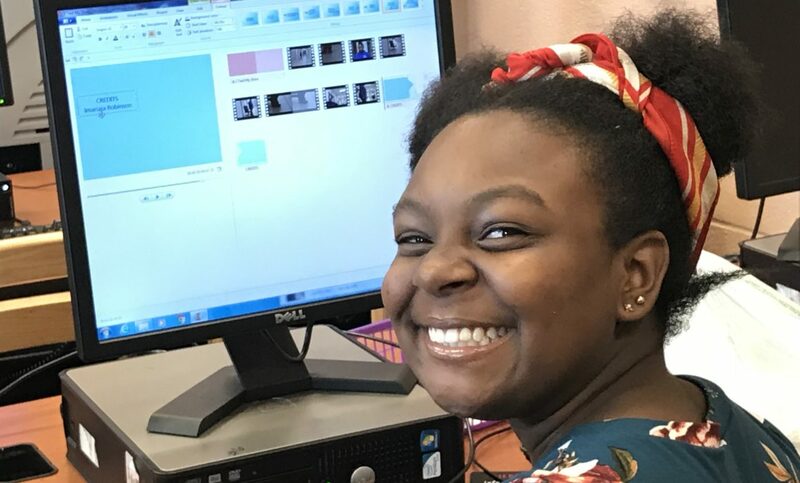 Many of my students struggled in the very beginning, because quite frankly, they had never been introduced to the concept of understanding how to read and write using film or video. In other words, they had not yet tasted victory in learning video. 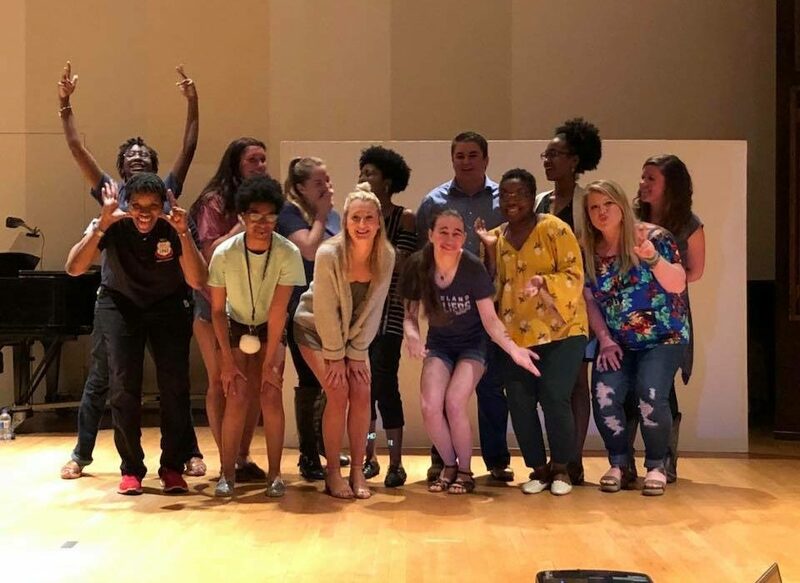 Yet as the semester continued, I saw what I have seen time and again with this extremely effective approach – they were learning to be better communicators. This became obvious at our final class screening. 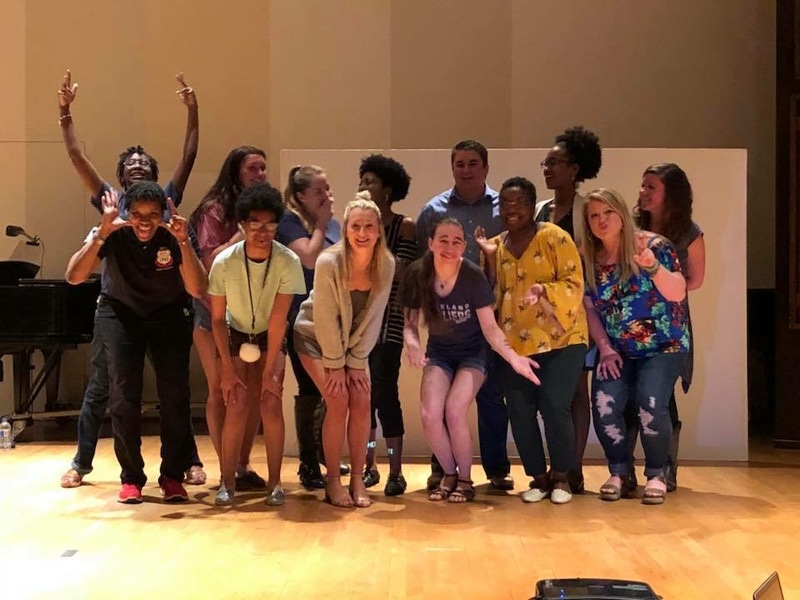 Each student debuted their 3-5 minute documentary to 75 attendees in the Spears Concert Hall on campus, to an incredulous audience who couldn’t believe they accomplished so much in so little time. In the talkback after the screening, students commented on how they began to ask themselves questions like “What am I trying to say?” and “What question am I trying to answer?” when setting up a shot or re-doing an edit. These were questions they were never taught to ask before when learning video. These are the questions that you ask when learning to communicate. It was exactly by asking those types of questions that allowed them to have films that transmitted their ideas and messages more clearly. This spring at Columbia College my intention was for my students to learn how to read and write a new language, i.e. the language of film. Students came to class with basic fundamentals for how to use a video camera, but they did not know that the camera uses its own language, and how understanding that language could make them better communicators. Students discovered a new process that not only taught them new skills, but also improved their ability to communicate. And that is a victory. Interested in watching the 13 short docs that my students wrote, filmed, and edited all by themselves? Check out their youtube channel HERE. It is very difficult for me to talk about the importance of media literacy without getting upset. The inadequacy of being able to critically think about media messages in modern society that operate in a world that is literally run by media and media content is, frankly, beyond my comprehension. It was from Jacob Burns Film Center founder (and visionary) Stephen Apkon that I borrow the phrase “World of Screens”, which comes from the title of his book “The Age of The Image”. Both phrases are correct. We live in a world dominated by screens, ruled by images. Yet, a 2016 Stanford University study revealed that American middle school, high school, AND college students had difficulty judging the credibility of information that they found online and are frequently duped by fake news, biased sources, and sponsored content. This can’t be real life. But it is. I have a myriad of personal reasons why I believe media literacy has had such a tough time catching on, but I’ll save those for another blog. What I would like to spend a little time on though, is what media literacy can do and how the influence of media literacy is detrimental to basic education fundamentals. When we become old enough to walk and talk we begin cultivating our literate abilities. In school, exploring how to read and write printed text – based on the language that we learn – becomes the basis for all education. A lot of good history, science, or math would do you without the ability to read and write. It is the very foundation of how to communicate and learn in any society. So if literacy is THAT important, why isn’t MEDIA literacy? Basically, the ability to critically think about media messages? At the very least moving image literacy should be of utmost importance. This segment of media literacy focuses on images that move – in layman’s terms, video or film. It is designed to equip students, educators and entities with the tools to be literate in moving images – the ability to read and write images that move. It’s specifically the work we do at OTR Media Group. We are a film and strategy company whose work focuses not just on production, but also educating the next generation on media literacy. And this is work that I am very passionate about. We live in the ‘World of Screens’. U.S. adults spent 10 hours, 39 minutes a day consuming media in the first quarter of 2016. By 2017, online video will account for 74% of all online traffic. With that amount of video being available to the average American on a daily basis, one would think being able to READ it would be moot. But it’s only recently that Washington and states like Connecticut have begun passing legislation urging wide ranging media literacy programming in K-12 schools involving moving images. But, the effects of a non-literate society, especially in the United States, are already damaging. There are several major problems with print illiteracy that groups like The Literacy Foundation already understand. However, I just want to highlight the very first one they point out – of which I feel is the most important – and that is the “limited ability to obtain and understand essential information.” The most glaring of these examples is the sudden rise of fake news in America. Being able to understand essential information, like whether or not something is the truth or a lie, is critical to not only human development, but societal development – and governments around the world join the US in combating this problem. The lack of literacy education adds fuel to this already burning fire. Unfortunately, with moving image literacy, many parents, educators and educational entities think that being media literate is the ability to USE video or video technology. But just because you can use a hammer to drive a nail into a piece of wood doesn’t mean that you can build a house. Simply put, having a video class in your school doesn’t make students media literate. Moving image literacy especially, requires the learning and understanding of a new language, in addition to being able to question the intent, structure, creator and perception of a media message. For instance, understanding what a ‘wide-shot’ means and how it is used to communicate a message is no different than understanding the importance a subject or a predicate has to the structure of a sentence. Before you can create sentences, you have to understand the rules of how to put a sentence together. This is what learning language is all about. If you jump to trying to have a conversation in any language, before you can understand how to put together a sentence IN that language, well, that’s the equivalent of trying to build a house simply because you hung a picture frame neatly on a wall. This is why this new literacy is important right NOW. We are sending our children into society media illiterate – and quite frankly, a 3rd period video class or a video summer camp isn’t going to cut it. Our children are entering a video driven world that is expecting them to already know how to ‘build houses’, and that is taking full advantage of them when that world finds out that they do not. Moving image literacy has to become the new literacy for societies around the globe, but particularly our society, so that we can effectively educate and prepare each other to operate successfully in the “World of Screens”.